An information icon in the Franklin overview highlights water management—how the clay-lined pond catches rainwater and pumps it through underground pipes toward the plant beds. The garden also has cisterns that catch and store rainwater. 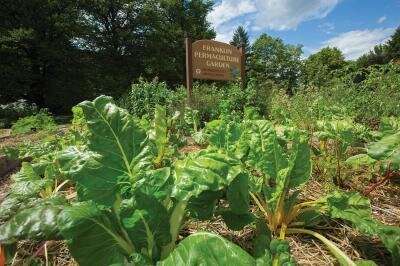 The gardens are rich in diversity—some 200 plant species—and layers of perennial plants penetrate deep into the soil, offering climate resilience from drought and flood. Maintaining living roots in the soil throughout the garden year-round also promotes soil health and better crop yields.